GILL Technologies franchise business opportunity. Free GILL Technologies business franchise information. GILL Technologies franchises provide cost reduction and management of business communications for companies of all sizes. Our solutions and consulting services encompass mobile, telecom, network, internet, and data applications. From our initial un-biased cost audit to our ongoing management, reporting and single point of contact services - Our franchises take their clients' communications to the next level allowing them the time and money to focus on their business. Those selected to operate a GILL Technologies franchise, work with professional business owners and managers to help them save money on communications. 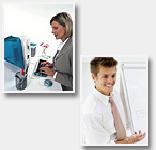 Our system is designed to allow you to work out of a home office. We give our franchisees the best of both worlds, the flexibility and comfort of working from home and the excitement of being in the professional, business-to-business communications industry. To get your business off to a running start...... GILL Technologies provides a turn-key solution. GILL Technologies has been providing cost reducing solutions and added value services to small, medium, and corporate business since our inception with communications experience dating back to 1989. Our association with a vast majority of Canadian and US carriers, combined with our dedicated team of specialists, work to reduce companies communication costs. As their company grows and their communication needs increase, GILL Technologies is there to provide them with recommendations and alternatives. Through a comprehensive, unbiased analysis, GILL Technologies designs, implements and supports guaranteed cost saving solutions for businesses. We are proud to provide a large array of products and services creating a complete communication solution for our clients, all backed by support from our ClientCare Team. To learn more about the GILL Technologies franchise opportunity simply complete the form below.